Perks of Having a Small Wedding Party — Sweetchic Events, Inc.
We understand that sometimes it can be a challenge to narrow down who you want to stand by your side if you have A LOT of close friends or big families. Personally, we love a smaller wedding party (and not just because it's easier to herd 6 people, as opossed to 20). Here are some benefits of having only 1 - 3 friends on each side. Wedding days can be LONG. And in the case of the getting hair & make-up done, the day can start very very early. We've had hair & make-up starting at 6 AM because we have to squeeze in the bride, 7 bridesmaids, 2 moms, and grandma before the First Look at 2 PM. If your reception ends at midnight, that's an 18 hour day! With a smaller wedding party, you can sleep in longer - get that beauty sleep! Things also tend to be a bit more relaxed when there are less energies filling the air while getting ready. And we weren't joking about how it's easier to herd 6 people than 20. When you're looking to take photos around the city, more people equals more time shuffling people along, getting them on and off the bus. 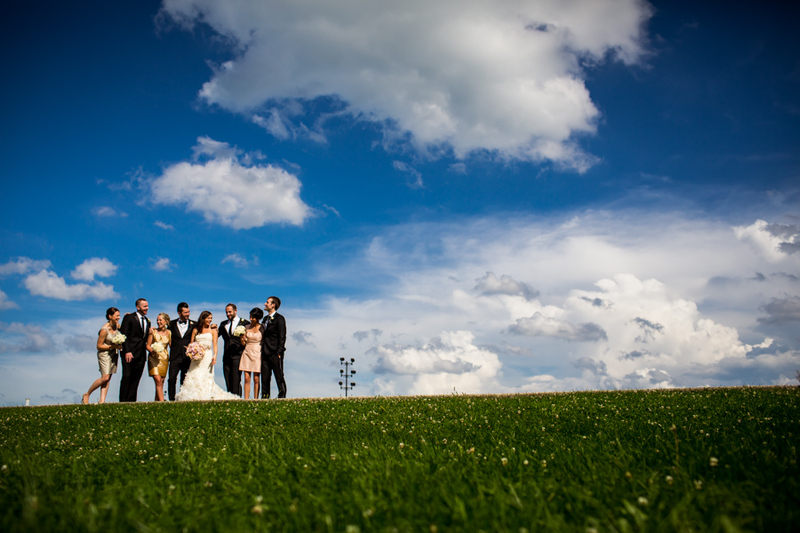 Once you're out taking photos, situating 20 people in a shot, can take some time. In the end, those with a smaller wedding party will spend less time taking photos, and will probably still get more photos out of that time. Weddings are expensive (surprise!). And the little things add up quick. Many couples choose to pay for the ladies hair & make-up (or if the gentlemen do a hot shave!) which is a very generous offer because it can be pretty pricey. And to think that's not the only gift you may be giving them. Many couples choose to do gifts for their wedding party as a token of their appreciation. And we've seen some REALLY nice gifts. If you choose to give gifts of any kind, having a smaller wedding party will be in your wallet's favors. Yes, we love our friends dearly. But in the middle of wedding planning emotion, sometimes its just easier to deal with 1 or 2 peoples opinions when dress shopping and color coordinating. There is truly a sense of closeness and ease on the wedding day when the couple is surrounded by their closest friends. A sibling who has been there for you for your entire life. Your best friend who you've known even longer than your spouse-to-be. Some couples choose their Wedding Party over a year out from the wedding date. Not to be a Debbie Downer, but friendships can ebb and flow in the course of a year, so it is definitely something to think about before you ask your work friend to stand by your side. But, that doesn't mean they can't participate in the other fun wedding activities! Friends of all kinds are invited to bachelor/ette parties and showers! By the way... we also want to share that we love when couples have "Groomsmaids" or "Bridesmen", or whatever you want to call them. Don't think that just because you're a guy, that all the party on your side needs to be men! Nic, pictured above, had both his sisters as his groomsmaids. They wore grey dresses to match the grey suits!